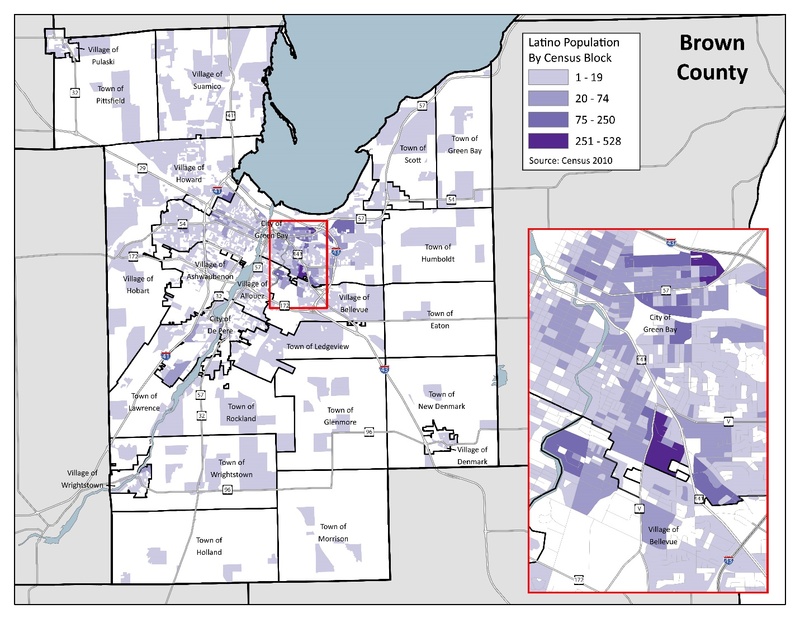 The Latino population of Brown County has in-creased more than thirteen-fold since the 1990 Census, and its share of the county population is now ten times larger than 25 years ago. Since 2000, Brown County’s population has risen 13% while the Latino population has more than doubled; the increase among Latinos has accounted for 40% of the county’s population gain. Municipality Estimated Population Estimated Latino Population Pct. Latinos Pct. of Latinos in Co.
Based on the 2010 – 2014 American Community Survey (ACS) estimates, one in eight residents of Green Bay are of Latino origin. More than two-thirds of the county’s Latinos live in the city, with most of the balance in seven other municipalities. ¹Five-year ACS data for 2010-2014 is the only source of municipality-level estimates more recent than the 2010 Census for many demographic, social, and economic characteristics. Because of margins of error, caution should be exercised in drawing conclusions from the ACS for small areas. Block-level maps, available only from the decennial Census, reflect the higher numbers of Latinos in the areas east of downtown Green Bay; the southeast part of the city near U.S. Highway 141 and County V; and east of the I-43/Highway 57 interchange. The map also shows scattered populations of Latinos through most of the other municipalities in Brown County. 25% of the non-Latino population was ages 0-19, while the comparable Latino percentage was 47%. 33% of the non-Latino population was ages 20-44, while the Latino percentage was 38%. 28% of the non-Latino population was ages 45-64, while the Latino percentage was 13%. 14% of the non-Latino population was ages 65 and older, while the Latino percentage was 2%. The median age for the county’s non-Latino population in 2014 was 38.7, while the median age of the Latino population was 22.0, or nearly one-half that of non-Latinos. The male:female ratios of Latinos are higher than the corresponding ones for non-Latinos. 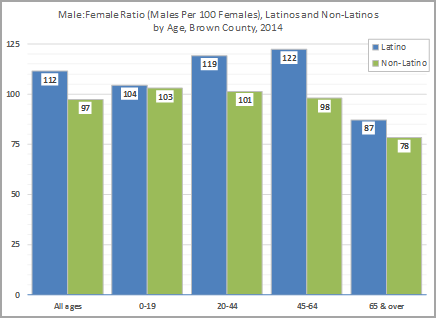 For all ages in Brown County the ratio of Latino males to females is 112 to 100; among non-Latinos, there are fewer men than women. High male-to-female ratios are particularly evident in the prime working age categories of 20-44 and 45-64. Given that the Latino population is younger, it is not surprising that the proportion of Latino-headed households who are renters is much higher generally than among non-Latinos. In Brown County, two-thirds of Latino-headed households rent, compared to one-third of non-Latino households. With a higher share of renters than owners, Latinos also tend to be more likely to live in multi-family than single-family housing units. In Brown County, one-half of Latino-headed households live in multi-family housing (structure with 2 or more units), compared to only one-quarter of non-Latinos. The Latino population tends to live in family households at rates greater than the non-Latino population. In Brown County, nearly one-half of Latino households are married couples with children, and another nearly one-quarter are single parents with children. In contrast, non-Latino family households tend primarily to be made up of married couples without children in the home (influenced by the age pattern: many of these couples are likely “empty nesters” whose children have grown and moved away) and single people living alone. Because more Latinos live in family arrangements and, more often than not, have children in their households, their average household and family sizes are larger than those of non-Latinos. 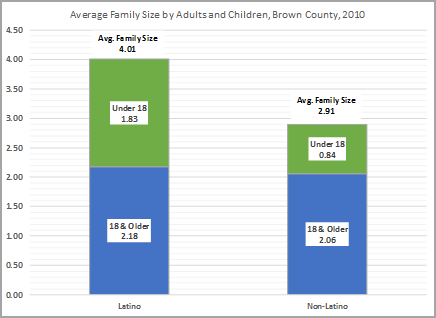 In Brown County, the average Latino-headed family has just over 4 members, while non-Latino families average about 2.9. Nearly three of four Latinos in Brown County identify Mexico as their country of heritage or origin, and ten percent report Puerto Rico. Other Central and South American countries and some Caribbean nations (e.g., Cuba, the Dominican Republic) account for the balance. 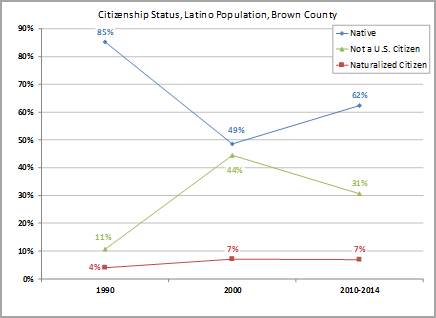 With regard to citizenship status across the past 25 years, immigration to Brown County during the 1990s was robust, producing a sharp rise in the number and percent¬age of non-citizen Latinos, and a consequent decline in the percentage of native citizen Latinos (even though numeric increases were strong). However, over the past 15 years the percentage of native citizens rebounded, with a resulting decline in the share of non-citizens. In Brown County, one-fourth of Latino residents reported speaking only English at home, while nearly three-fourths report speaking Spanish as their primary home language. 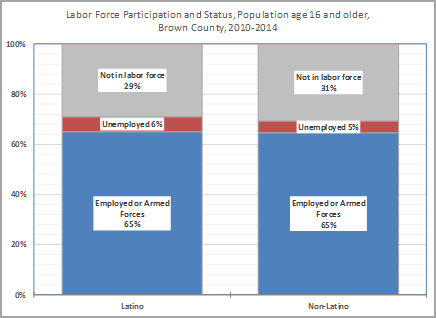 In looking at employment among Latinos and non-Latinos, in Brown County the participation rates in the labor force are very similar. Because non-Latinos are relatively older, it is not surprising to see a higher percentage for those not in the labor force. State-wide, Latinos’ corresponding labor force percentages were 64% employed, 7% unemployed, and 29% not in the labor force. In Brown County, more than four out of ten Latinos reported being employed in manufacturing in the latter part of the last decade. Statewide, the percent in manufacturing was only 25%, with higher shares in the education, health care and social assistance (14%) and entertainment, recreation, accommodation and food services (15%) categories. ²The years 2006 – 2010 are the most recent period for which occupation-by-industry estimates are available. 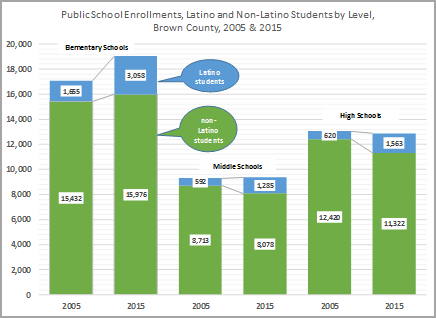 Over the past 25 years, the educational attainment of Latinos in Brown County has been reflective of the pattern of recent arrivals. 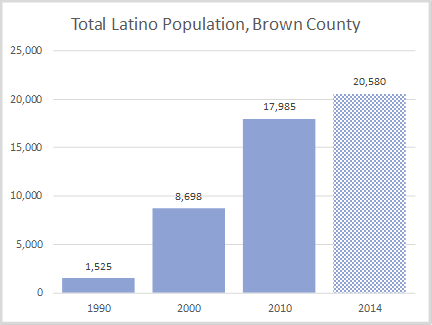 Brown County’s Latino population nearly quintupled from 1990 to 2000; many were foreign-born non-citizens (see graph in “Immigration and Countries of Origin” section earlier). Consequently, the share of those who had less than a high school education rose from 41% in 1990 to 58% in 2000. 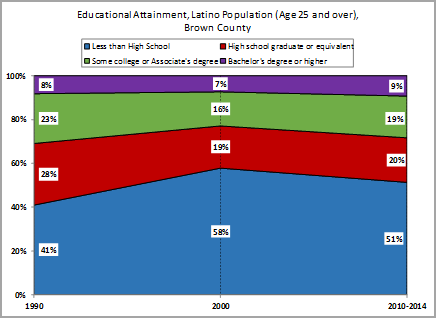 In the past 15 years, gains in Brown County’s Latino population have been robust but more tempered than the 1990s. The proportion of Latinos without a high school diploma has fallen to 51%, and other higher categories have risen. In terms of public school enrollments, the number of Latino students nearly doubled at the elementary level, more than doubled in the middle schools, and rose 150% in the high schools from 2005 to 2015. These increases helped to boost elementary enrollment and to sustain overall totals at the middle and high school levels as non-Latino enrollment declined. 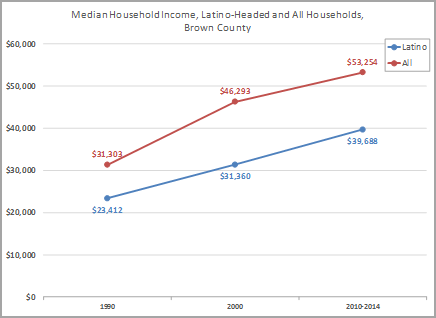 The median income for Latino households in Brown County has been consistently lower than that for all households. It was 75% of all households in 1990, dipped to 68% in 2000 (influenced by an influx of new immigrants in the 1990s) and returned in recent years to 75%. Statewide, Latino households’ median income was approximately 70% of that of all households during 2010-2014. 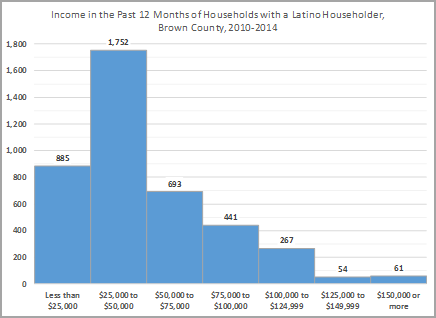 The incomes of Brown County’s Latino households are concentrated between $25,000 and $50,000; more than four of ten households had incomes in this range. Roughly 20% of households had incomes below $25,000, and just under 20% had incomes from $50,000 to $75,000. The poverty rate for Latino families in Brown County was 22% during the 2010-2014 period, compared to 8% for non-Latino families. Of Latino families with incomes below the poverty line, one-half were married-couple families with children, and four of ten were female-headed households.